Chinese exporters on the China-Russia border are feeling the pinch as the ruble’s steep decline reduces the purchasing power of Russians. Zhou Changwei runs a wholesale garment shop in Suifenhe, a major gateway city for trade with Russia in northeast China’s Heilongjiang Province. Business is the worst it has been since 2005, when he started selling clothes to Russian clients. Last December, the central government authorized the border city of Suifenhe as the country’s first pilot zone where the Russian ruble can function equally alongside the Chinese yuan. “When I was restocking for autumn and winter clothes, I thought the ruble’s drop would be temporary, since the currency has also fluctuated at times in previous years,” Zhou said. This time, however, the depreciation has been continuous and drastic. The ruble has lost nearly 50 percent of its value against the U.S. dollar and euro since March. 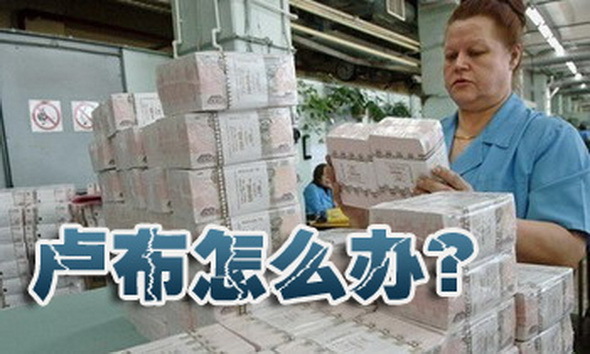 Zhou said his Russian clients’ demand has shrunk greatly and he has received almost no orders in the fourth quarter. “Such a large price increase is unacceptable to many Russian clients,” he said, adding that he has an inventory of autumn and winter clothes worth over 2 million yuan. In the Qingyun market where Zhou’s shop is located, many Chinese merchants are under the same pressure due to high inventory. The market, once full of Russian merchants looking for Chinese products, has become desolate with the plunge of the ruble. Wang described his business as “frozen,” saying that his sales volume this year was only one-third of last year’s. “In the past, I could sustain a factory of over 30 workers, and now I have difficulty hiring two attendants,” he said. In addition to business, travel between the two countries has also been affected. According to the city government of Suifenhe, the registered number of Russian travelers entering the city was 39,800 this November, compared with 45,700 in November of last year. The number of Russians entering another border city, Heihe, in Heilongjiang Province, dropped by 10.2 percent during the first 10 months of this year. The border region is not the only place feeling the pain of the ruble crisis. The Geely automobile company, located in east China’s Zhejiang Province, published a notice on Dec. 16 forecasting that the company’s net profits this year will drop by 50 percent from last year, partially due to the exchange loss caused by the depreciated ruble. According to the China Association of Automobile Manufacturers, Russia has become a major market for China’s car makers, and there are a dozen Chinese automobile brands being sold in Russia. Despite the sluggish Russian market, many Chinese businessmen like Zhou Changwei are still full of hope. “The Russian economy will undoubtedly be cured sometime in the future. No matter how hard it is, I will stick to my current business since I have already established precious long-term partnerships with Russian clients,” he said. Since the beginning of this year, the central bank of Russia has hiked the key interest rate by 6.5 percentage points to 17 percent. During a year-end press conference last week, President Vladimir Putin praised the efforts by the central bank and the government to stabilize the ruble and noted that it would take at most two years for the Russian economy to rebound under the most unfavorable scenario.